You must be a member of the London Business and Social Networking Group to attend this activity. Would you like to join this group? Let’s all have Saturday ay Brunch together! Please bring your business cards and be prepared to discuss what you do, and how we can add value to each other. 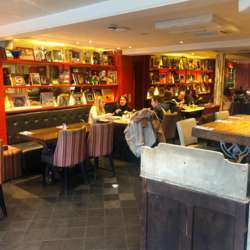 Zefi has fabulous food, Mediterranean based, great service and great atmosphere! Looking forward to meeting everyone! Prices start around 12£ and go up. Fees listed are an approximate expense.